As you clean up your yard this summer, consider how you plan to dispose of all that yard waste. Maybe it’s time to start composting grass clippings and weeds. Building a compost bin can be as simple as looking around your yard for materials you can recycle and make into a container. Before we start construction though, let’s decide how best to set up our composting station. Define your composting needs – Do you want to get rid of yard waste or do you want to commit fully to recycling and add kitchen scraps into the mix? Check for local restrictions – In some areas you have to set compost bins a certain distance from lot lines. This is particularly true in urban areas. Consider the physical work required – Compost piles need to be “turned” to allow materials to aerate and to avoid clumping. You will need to shovel the compost material with a pitch fork or other heavy-duty tool, which means your upper body can get a good workout. If “turning” compost does not sound like fun, consider constructing a “tumbler”-style bin and crank your way to the perfect compost. Determine a location – Find a spot in your yard where the bin can benefit from an adequate mix of sun and shade. Full sun will dry out your pile and full shade won’t allow the pile to dry out enough. Avoid putting the bin close to trees so it doesn’t damage the roots when you stake it into ground. Place close to a water source – Watering your compost pile is the key to promoting good breakdown of materials. A compost pile should be kept moist like a damp sponge, but not soaking wet. Keep drainage in mind – Make sure the location for the bin is level and offers good drainage. Plan for good ventilation – Compost piles need adequate ventilation for the materials to decompose. Size always matters – Build a bin that is not less than 3 feet by 3 feet or greater than 5 feet by 5 feet. Too small and the compost may become compacted; too large and it will not get adequate air circulation. What’s that smell? – If you are adding kitchen waste like fruit and vegetable peels then your bin may attract pests. Burying the peels in the compost will deter critters from creeping into your compost pile. You can add calcium or lime to keep any unwanted smells down, too. What will the neighbors think? – Once you have decided where to build, consider how others might view your gardening project. Camouflaging the bin with lattice or high growing shrubs to block the view will help it blend into the landscape. After considering these factors, you are ready to select the design of your compost bin. You can build a composter out of a number of different materials. If you are using wooden slats, be sure to keep a 1-½” space between the boards for good air flow. If you need to keep rodents out of your pile, incorporate chicken wire and a secure lid into your design. Avoid using plywood since the moisture in the compost pile will cause it to break apart. 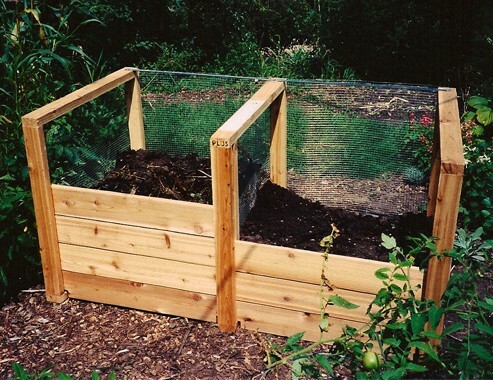 Building a compost bin can be as simple or a complex as you want to make it. All you need are the materials, some basic tools like a hammer and circular saw and your imagination. Once you’ve completed your brand new compost bin, it’s time to start layering. Start off a compost pile by layering equal measures of brown waste, green waste and top soil. Water the pile once you’re done and wait for nature to take its course. After a week or so, “turn” your pile and work in new materials. You don’t have to continue layering once your compost pile has started. Find out what NOT to compost and more information in our blog, Go Green: Create a Compost Collection Pile. Our expert staff is always on hand to help you with your composting projects. From circular saws to wheel barrows and shovels, if you have any questions about what to choose, pricing or how-to’s, don’t hesitate to contact us. Stop by our store — we’re open seven days a week.